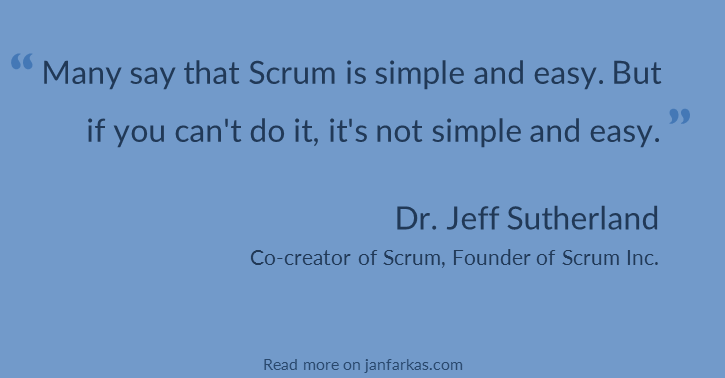 farkas on innovation | Is Scrum trivial? perfect illustration of the current status of global Scrum understanding and adoption. Scrum looks very simple and straightforward: You just have to implement the Scrum Guide, which is less than 20 pages, right? The trick here is that the Scrum Guide contains only the actionable parts of Scrum, but the why’s, the context and the history are mostly missing. Without its deep and rich context, you’ll have a hard time implementing Scrum right. We, independent agile experts often get called into the project at this point. Sometimes we need to help you to “Descale”: To tear down the prematurely scaled organization to its atoms, the teams, fix Scrum at the team level and start to scale it again in a robust manner. This is not a small thing, and so some executives get disillusioned at this point. With a good expert on your side, the illusion that Scrum is simple and easy will be gone to give place for a serious work on company culture. Without proper help though, you might get disillusioned in Scrum and Agile itself. I’m sure you’ve heard that “Scrum is nice in theory, but it does not work in practice”, “Scrum is for teams but it doesn’t scale” or “Scrum is naïve”. Don’t throw the baby out with the bathwater. Those who make Scrum and Agile work, rule the markets. Be one of them! You can read and download my Scrum meetings cheat sheets here and you can read my worries about the status of Agile in 2018 here.